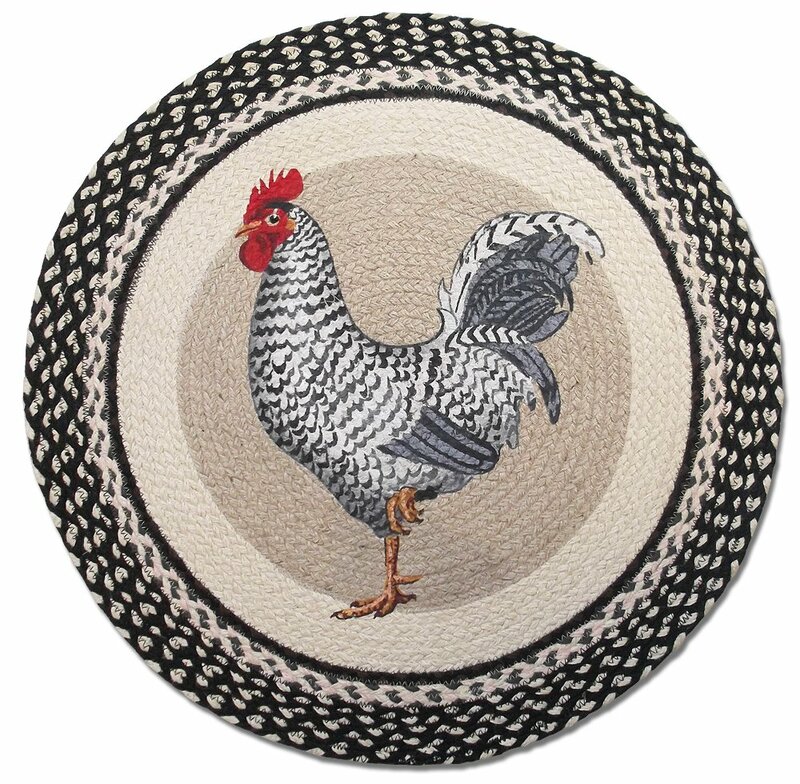 Rooster Rugs for the Kitchen Add to Flipboard Magazine. 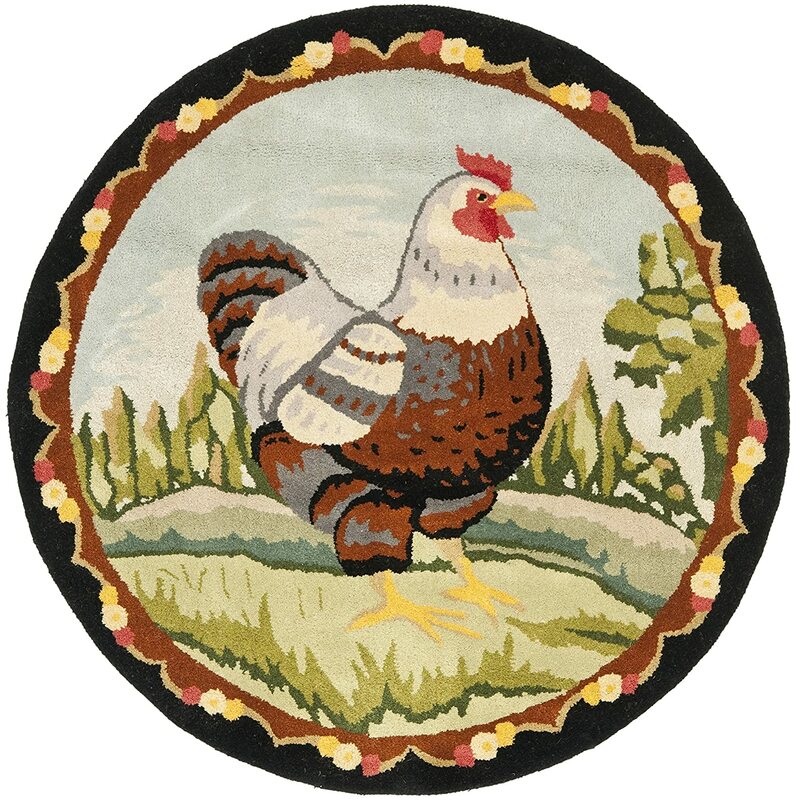 If you have a Rooster Kitchen, then you have probably been looking for Rooster Rugs. 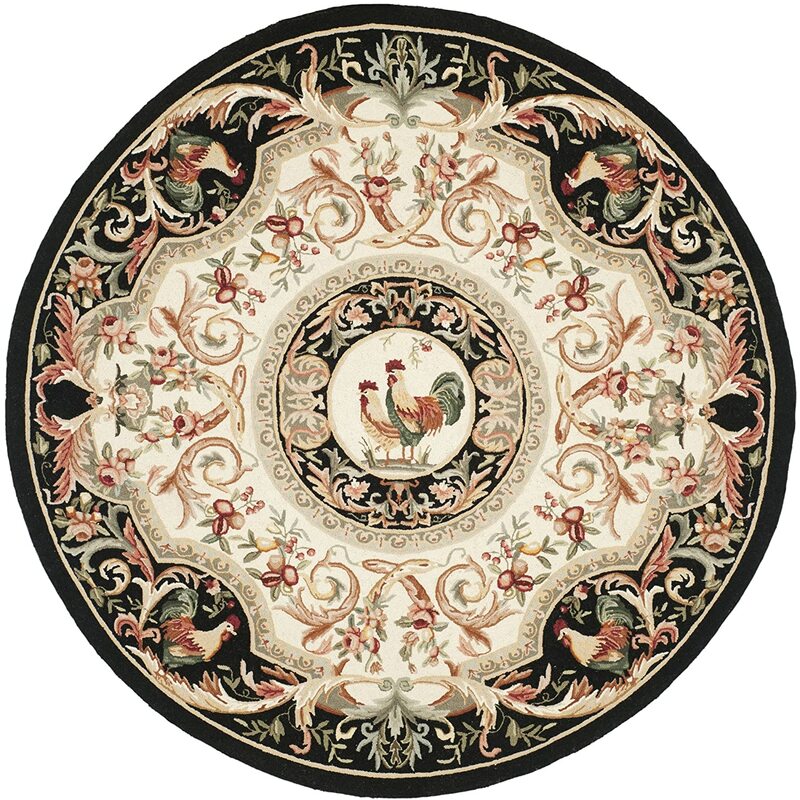 A kitchen is not complete without a rug in front of the sink, the stove and usually at the back door. 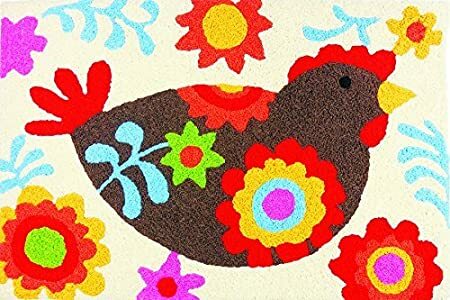 I think it ties a kitchen theme together when you find rugs that match. 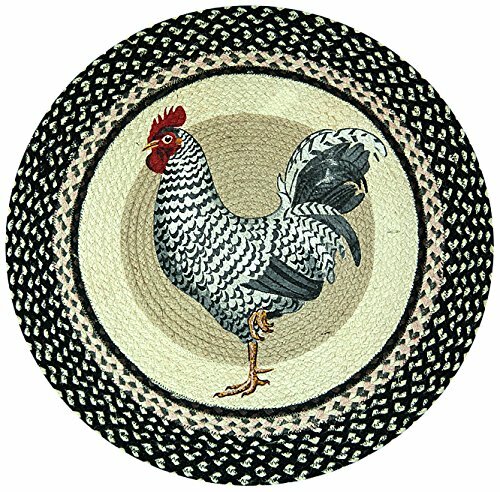 I have fallen in love with several of these Rooster Rugs. We have wood floors, so a nice rug is important to me. 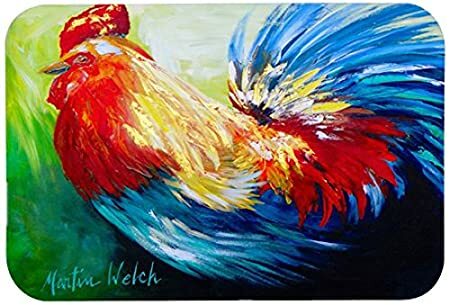 I am not the type that fills every nook and cranny with rooster stuff, but I do like to tie the theme together. 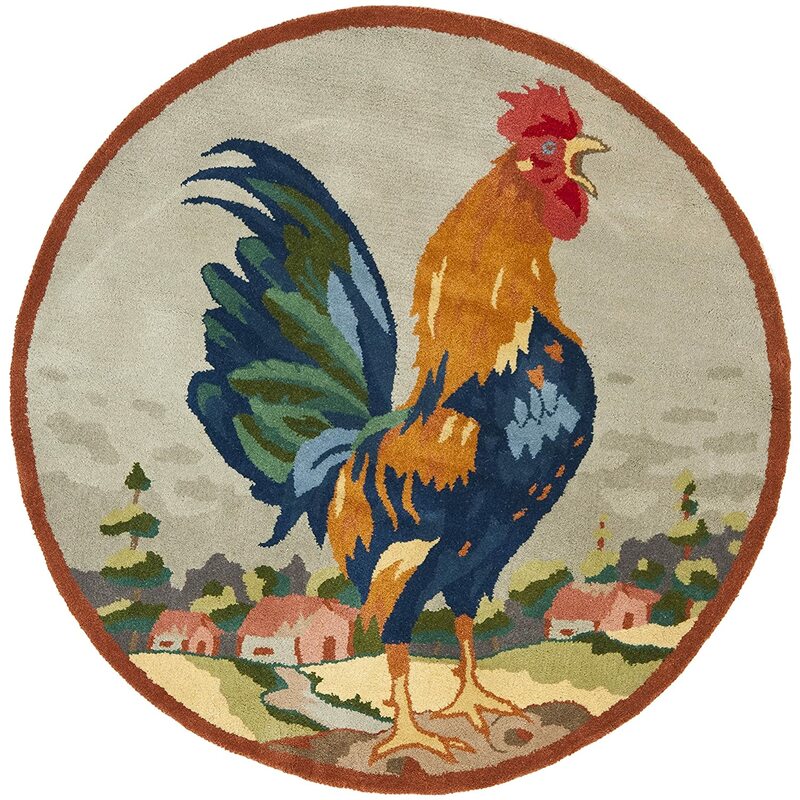 Finding the right rooster rugs is the hardest part. When I look at the big box stores, they never have what I am looking for. So Amazon is my go-to place to find very specific items. 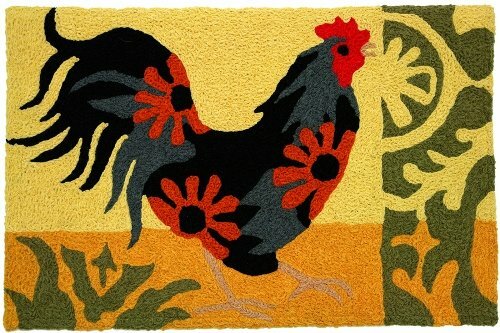 I am in love with the handmade wool rugs. 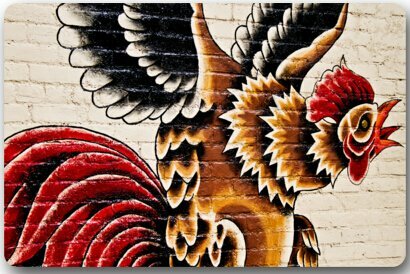 They are a work of art and you may decide to show them off on the wall instead of on the floor. 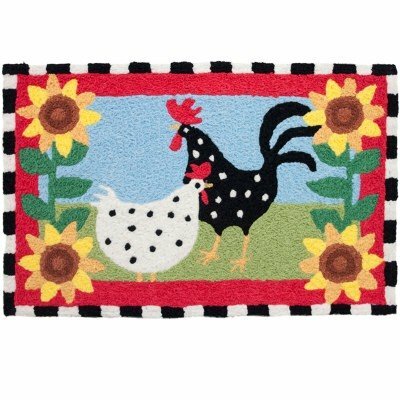 For me, I need rugs I can wash. We have a little dog and she loves to carry her food or bones to my rooster rugs. Some of these can be washed and others need professional cleaning. There are also some that already have the no slip rubber on the back. I do prefer those because of the wood floors. But if I had carpet, I wouldn’t choose those. So it really depends on what your kitchen has as far as floors. 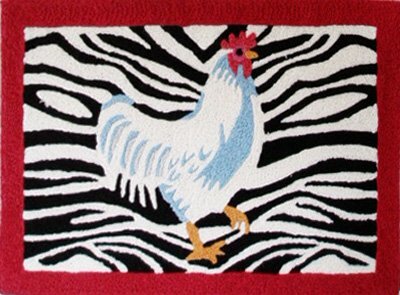 Many here are hand-made rugs which means you can vacuum it and clean up spills with a wet rag. Please don’t try to wash them in the washing machine. 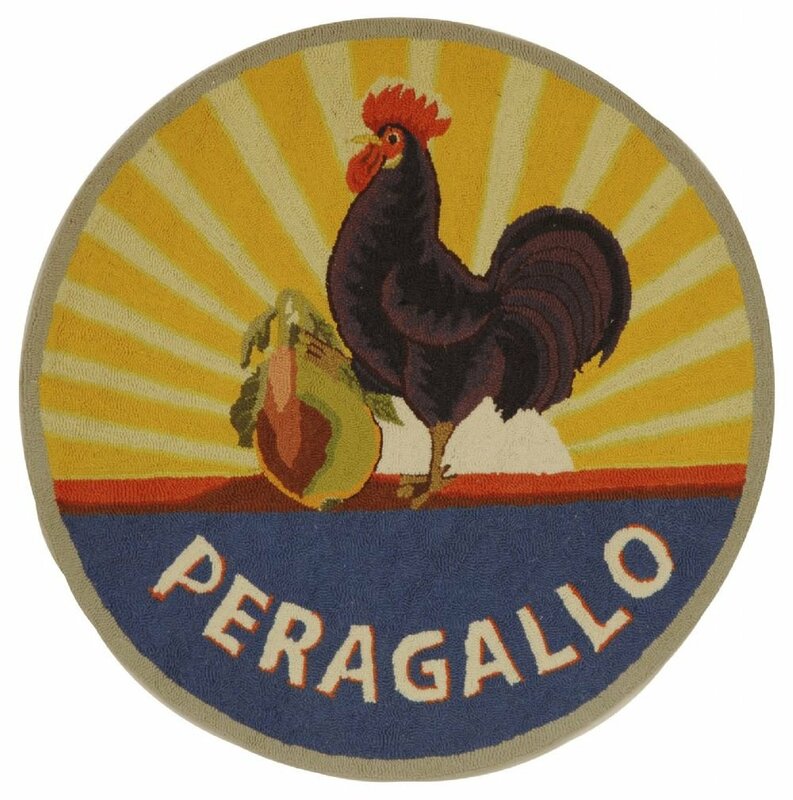 They are made of wool and wool shrinks. That would be sad. 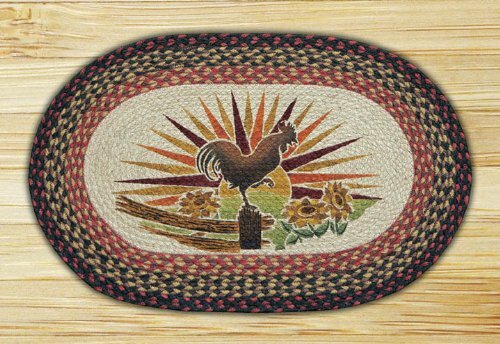 I think that braided rugs are the epitome of country decor. 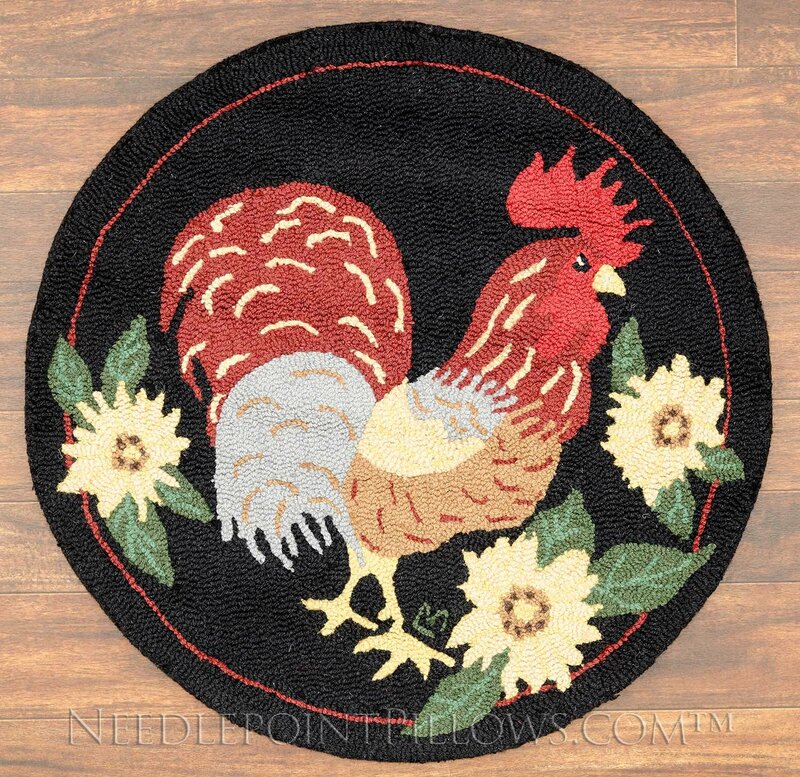 Years ago our grandmothers would make these braided rugs out of scrap material. They are so beautiful! I wish I had some of my great grandmothers hand braided rugs still. 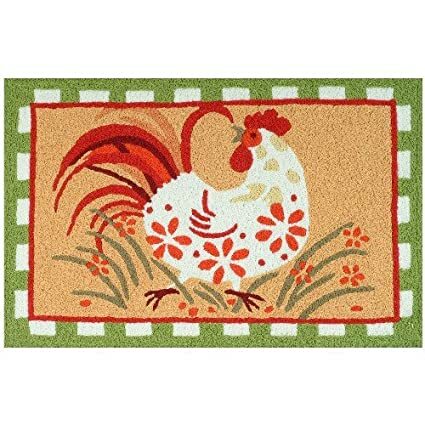 Many times you can find rooster rugs that look like they have been braided, but they are really just printed on there. 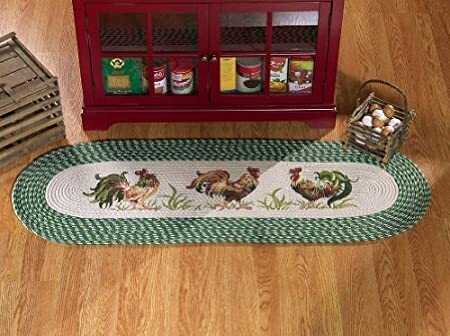 I really prefer the braided rugs. I was raised with them and nothing beats them. They also can’t go in the washing machine, but they clean up nicely with just a little soap on a rag. You can have them professionally cleaned. 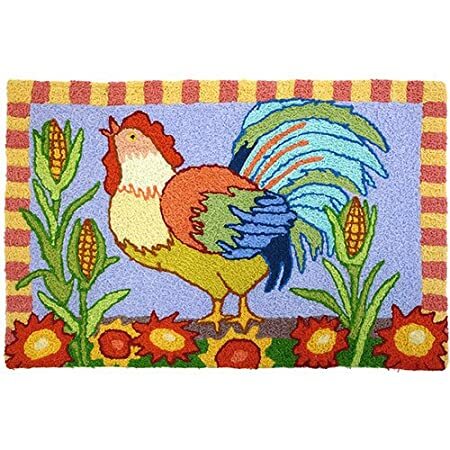 If you don’t have a lot of color in your kitchen, you might decide to go with a fun and colorful rooster rug. These are more modern and so much fun. These are all machine washable and can be used indoors or out.